It’s day 700 7 of kindergarten. Some things are going great, some things are not, but EVERYTHING is going exactly how it is supposed to go on day 7 of school. There is lots of running, and just as much playing. There are daredevils standing on chairs to get their block buildings just an eensy bit higher, and there is fingerprint in places no fingers could possibly reach. There is laughing, and there is crying, there are moments of chaos, and there are moments of calm. On the first few days we saw a lot of head shaking or refusal when it came to new things- it makes sense given that EVERYTHING IS NEW- but we wanted to set a tone of bravery. Keep it alive! We have lots of optimistic crowns to keep handing out, and we are telling and retelling stories about being optimistic. It’s looking like we might need to introduce flexible next, and that will be the next item on the chart! We nestled the I statement in the context of our problem solving routine, and we made it manipulative so kids interact thoughtfully with the concept of problem solving. We made a visual of the “You” situation that was happening and X’d it out, and this is our alternate. 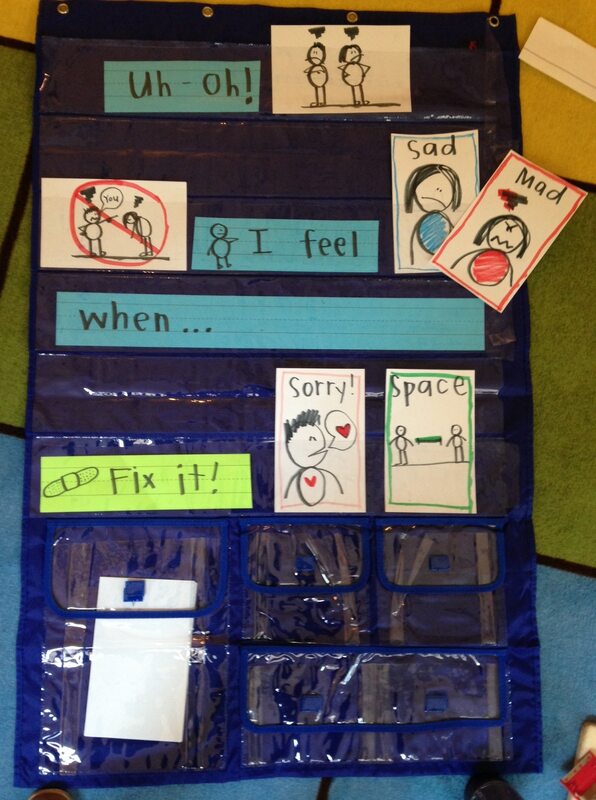 We have 2 feelings: mad and sad and 2 solutions: say sorry and take space. At the bottom are white index cards that can be used when we encounter a new feeling or invent a new solution. It felt important that it be interactive because then kids have a tool to think about their problem in more detail- so its more than going through the motions. We even added some: “I am a problem solver” stickers at the bottom to encourage kids to wander over there. “Come for the sticker, stay for the problem solving.” That’s our motto. We are teaching into shades of feeling and ways to calm yourself down. Mad comes into different sizes, and you have to be on the lighter side to actually talk through problems. Stay posted for that! 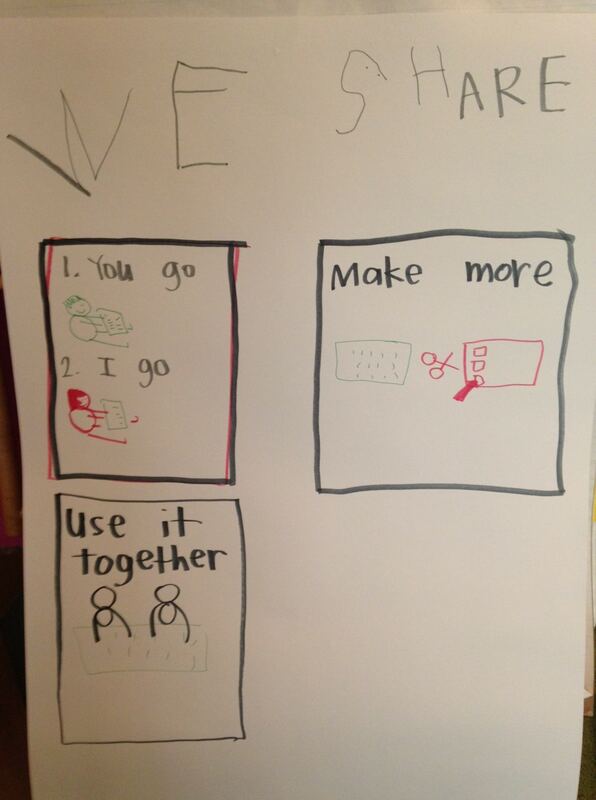 All the suggestions came from the kids, and we tried to build down what they said into easier to replicate language: you go, I go, make more (like make another pretend phone out of paper or blocks) and use it together. The hot ticket item is an old desktop keyboard which is what we practiced with, and what is in the picture. The hand drawn pictures are getting replaced by photographs, and there is room for more sharing photographs. We will have to wait and see, it helped a lot today for kids to have a space to choose sharing options and certainly decreased the amount we had to support the action of sharing. 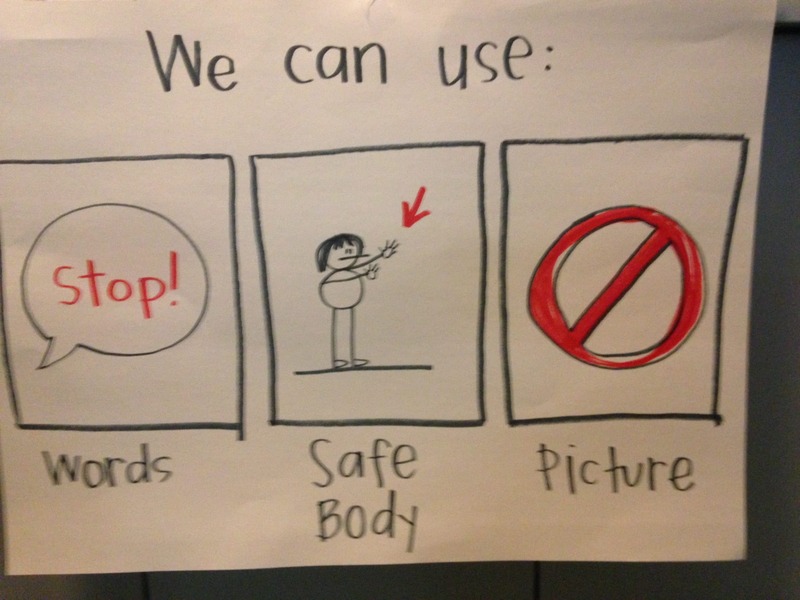 We have kids with different levels of language in our classroom, and so there was some confusion about what certain children wanted, especially around the idea of “stop”. We wanted to help the kids who feel like they have to use their body (to hit, for example) when the words don’t come fast enough. Each of these ideas is a thread we are going to follow in our classroom. Things will get added, refined, and elaborated until we have a community that functions like one we seek to see in the real world. Children that respect each others differences, listen to what one another need, and work to share and care for each other, will be the kind of adults that do the same. What more could we want? You gave such a perfect introduction to Jen Serravallo on the Ed Collaborative Day and said something along the lines of being given the opportunity to share in the way her incredible brain works..l( you said it so much more eloquently). But, my point is that I know that feeling with Jen, and I feel that way when I read your posts and book, too. I want to put Mindsets and these posts under my pillow at night and hope that though osmosis, I will wake up and be able to think the way you think. The format, “what we saw, what we did, what’s next” helps. I need to start with the observation part…. Because saying you saw kids “using their bodies to say stop, because the words didn’t come fast enough,” is a very insightful, sophisticated observation….not just a tally mark or even a typical anecdotal note. I need a a chart for me! I love your reflective and responsive approach to understands your students and your classroom community. Thank you for the reminder to step back, evaluate what I see, and use my observations to guide the action I take next.